The more I learn about Buddhism, the more I appreciate the many teachings of Buddha and the subsequent learned people who followed him, and the more I hear people speaking on such lessons – whether they realize it or not. Truth resonates like that. To find resonating truth in the time of the Kali Yuga – the Fourth Age of Deception – I try to find correlation of information among many subjects, and Buddhism both reveals truth and also correlates with truths from other cultures and also others systems; those of science, psychology and the esoteric. I will attempt to summarize one of the most profound teachings of Buddhism that can require an immense amount of absorption (another term for meditation or contemplation) to integrate – that there is Saṃsāra and Nirvana. Understanding this duality can lead to a greater understanding, being the ultimate contrast of Buddhism. First though, here are some teachings as a base to this idea. 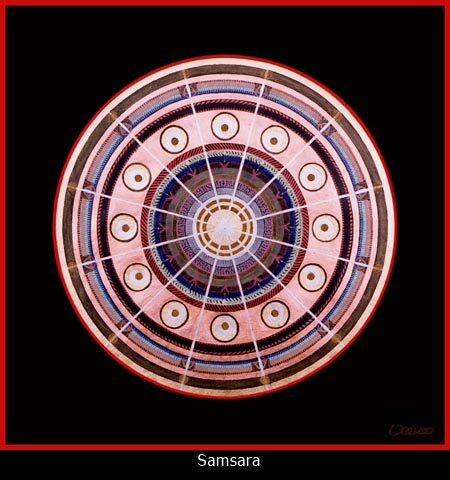 Saṃsāra literally means “continuous movement” and is commonly translated as “cyclic existence” or “cycle of existence”. In Buddhism, Saṃsāra refers to the continual repetitive cycle of birth and death that is created by our fixating on the self and experiences, specifically, the process of cycling through rebirth after rebirth within the six realms of existence. In the Buddhist view, one can only be liberated from Saṃsāra through Nirvana. Nirvana literally means “extinguishing”, and refers to the extinction of the fires of attachment, aversion and ignorance. In the Buddhist view, when these fires are extinguished, suffering comes to an end and one is released from the cycle of rebirth. Buddhists perceive reality and its volatile predictability through a set of conditions or principles, known as the Four Thoughts. One, we have a precious human body capable of gaining enlightenment and assisting others in the process. Two, everything is impermanent; ourselves and the condition of the natural and man-made world, if you will. Three, everything is made up of Karma; you are the result of it and everything that’s been done results in karma bouncing around. Four, we exist in the state of Saṃsāra, this gross physical realm where we can be either animals chasing tails or carrots tied to string – or we can become elevated beings. An optimal response to these conditions is contained in The Four Immeasurables. These are Love for self, Love for others, Love for the happiness of others, and Love for all in equanimity. The conditions of Saṃsāra require that we take compassionate courses of action via the Four Immeasurables – the four forms of love – otherwise we enhance our suffering and the suffering of others. Buddhists, having addressed reality thoroughly, realize that in every meeting there is parting, in every spring there is fall, and in every birth there is death. Saṃsāra is the happiness and hell on earth, the everything. Its opposite is Nirvana. Samsara is everything in reality. 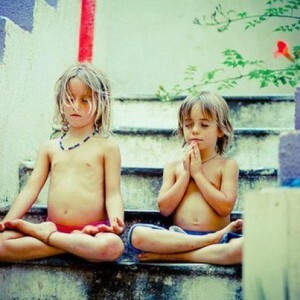 Nirvana is nothingness; the bliss that just IS, the essence beyond birth and death and even beyond duality. It is oneness. Here in Saṃsāra, practically everything is polarized and more specifically in a dualistic state of polarity, a state where there is spring, there is fall and for every winter there is summer. Saṃsāra is a war world, a place of ego and power, of total contradiction. We fight in the name of peace, poison our bodies with toxic “medicines” and unnatural foods, and view our religious faiths as a point of separation, not of Oneness. And so Saṃsāra will remain a war world until the Majority of Love takes control from the oligarchical institutions that rule over us globally. Until then, humanity will continue on the treadmill of birth and death, while it struggles to reconcile the duality of its own existence. There are lessons and concepts in this Buddhist teachings that can be applied spiritually and intangibly, in a multitude of ways. But Buddhism can all be seen as an allegory for how we approach our daily life and reality. We all have the ability to manifest Saṃsāra or Nirvana, here and now. We can act on behalf of lifeless institutions, ignoring the Four Thoughts and Four Immeasurables, or we can proceed in peaceful compassionate unison with each other – and remove the roadblocks of failed institutions along the way. Each of us, in equanimity, is just a wandering sentient being – and most of us are extremely compassionate at heart. In fact there is mounting evidence that humankind is evolving (from necessity) to become more compassionate. We have the technology and resources to provide for the energy, food and water needs of every human being on the planet, but dismayed, we stand back and watch our institutions direct our resources toward war and corporate empire-building. Why is it that we collectively fashion billions of dollars and thousands of people together for war instead of building equal infrastructure to help one another? Why are we allowing the others to dictate priorities to us which are so unaligned to our true nature? Because the majority of us are living in a state of warring consciousness; we were born into it; we exude that consciousness and manifest it outwardly via what are now long-standing war machines — those military, nuclear and industrial institutions and legislative devices that are either built to kill, or are slowly killing us anyway. But the Powers That Be forget the important lessons of history… the inquisitors and oppressors never win the battle, and no empire lasts forever. Choose peace over war, choose individuals over institutions, choose compassionate helping instead of passionate hindering. Remember The Four Thoughts and Four Immeasurables. When institutions try to build another war machine or oligarchical institution, or try to illicit another senseless war, remember: if it’s not done out of love it’s not worth doing. The only way out of Saṃsāra is through Nirvana. Author, activist and Tai Chi teacher Ethan Indigo Smith was born on a farm in Maine and lived in Manhattan for a number of years before migrating west to Mendocino, California. Guided by a keen sense of integrity and humanity, Ethan’s work is both deeply connected and extremely insightful, blending philosophy, politics, activism, spirituality, meditation and a unique sense of humour.